The attorney for the missing girl's mother is running a legal notice in the Morning Sentinel for three consecutive Tuesdays, starting April 2, to serve Justin DiPietro with the lawsuit. The mother of missing child Ayla Reynolds has a message for the girl’s father, Justin DiPietro: You are being served. That’s the gist of a legal notice that will be published Tuesday, as well as April 9 and 16, in the Morning Sentinel, notifying DiPietro that he is being served a summons and complaint for wrongful death in her disappearance. William Childs, the lawyer for Reynolds’ mother, Trista Reynolds, also will soon place legal notices in the Metropolitan News, a Los Angeles newspaper, as an alternative means of serving DiPietro because exhaustive efforts to find him have been unsuccessful. His last known address is in Winnetka, California, a neighborhood of Los Angeles, where a copy of the order will be mailed, and another one delivered. It also will be sent to the home of his mother, Phoebe DiPietro, on Violette Avenue in Waterville. The newspaper legal notice is a Cumberland County Superior Court order that says DiPietro must file an answer with the court within 41 days after publication in the newspaper. A Cumberland County Superior Court justice recently approved a request by Childs and Trista Reynolds for 60 more days in which to serve DiPietro with the wrongful-death lawsuit. Ayla was 20 months old when she disappeared from Phoebe DiPietro’s house at 29 Violette Ave. in Waterville, where the child had been staying with Justin DiPietro. 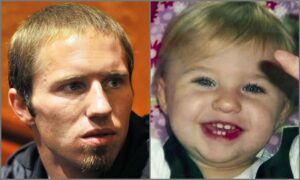 He reported Ayla missing the morning of Dec. 17, 2011, and has claimed she was abducted. But police say they believe Ayla is dead, and a judge in 2017 declared her so, paving the way for Trista Reynolds to file the wrongful death suit, a civil suit, in December 2018. No one has been charged in the case, though police have said all along that the people staying in the Waterville house the night Ayla disappeared know more about her disappearance than they are saying. DiPietro, his sister Elisha DiPietro, and Justin’s then-girlfriend, Courtney Roberts, were in the house that night. Phoebe DiPietro was elsewhere. Childs must file the newspaper legal notices with the court to prove that the order has been published. A process server in California will deliver a copy of the complaint to Justin DiPietro’s last known address in Winnetka. Once the court receives the legal notices, it will issue a discovery schedule whereby Childs plans to depose witnesses in the wrongful death suit, a process that likely will take several months. Asked by phone what happens if DiPietro does not respond to the newspaper notices, Childs said discovery, including interviews with witnesses, will continue. Efforts to locate him also would continue. Childs on March 13 filed court documents outlining his efforts to locate Justin DiPietro, including using private detectives in both Maine and California and searching government records and electronic databases. Childs’ court documents include private investigator affidavits, and an affidavit by a Kennebec County Sheriff’s deputy, Allen Wood, who said he tried to serve Justin DiPietro at 29 Violette Ave. in Waterville but was told by DiPietro’s mother that he does not live there and has not lived there for two years. Nelson Tucker, a server in California, went to Justin DiPietro’s last known address in Winnetka but was told he had moved out last July. Kevin Cady, a licensed private investigator in Maine, said he could not find a more current address for Justin DiPietro, though he searched social media, criminal records, driver’s license and vehicle information, property deeds, hunting and weapons permits and more. Tucker also searched social media, online telephone directories, a California criminal index, medical facilities, post office records and other documents.